Slim fit dress shirts have the modern cut and style for men who simply need a slim fit shirt that fits them tighter than a tradition dress shirt would. The slim fit look started taking off in a big way due to the favorable response on young men who are seen wearing these tight fitted style dress shirts. Younger men who favor tighter fitting dress shirts and clothing like slim fit suits have demanded that their dress shirts stop fitting so boxy that they have to spend even more money on them having them taken in by a tailor. Young men want them cut slim and dress shirt manufacturers have listened to you big time. 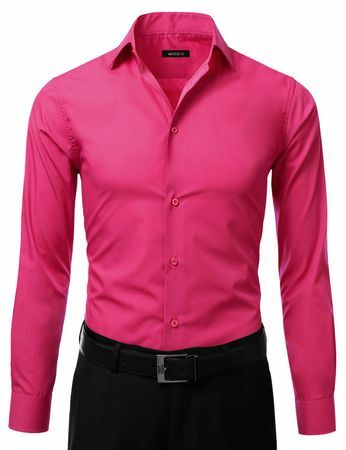 You'll find that our selection of shirts compliments our nice selection of Slim Fit Suits. 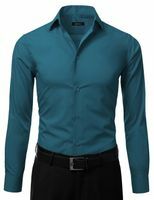 Contempo Suits is a great place where to buy slim fit dress shirts and more.